The third USS Nicholas (FFG 47) was laid down as Bath Iron Works hull number 388 on 27 September 1982 and launched on 23 April 1983. Sponsor at her commissioning there on 10 March 1984 was the same Mrs. Edward B. Tryon who sponsored the second Nicholas (DD 449) in 1942. Following her commissioning, Nicholas was deployed to the Persian Gulf, Mediterranean Sea and North Sea, and also participated in maritime interdiction operations and various fleet exercises. Visit the Nicholas (FFG 47) web site. Visit the Nicholas shipmates’ web site. When hostilities with Iraq broke out on 17 January 1991, Nicholas was serving in the extreme Northern Persian Gulf as an advance Combat Search and Rescue platform, more than 70 miles forward of the nearest allied warship. During the first few weeks of the war, she distinguished herself in action by attacking Iraqi positions off the coast of Kuwait, capturing the first of 23 Iraqi prisoners of war, sinking or damaging seven Iraqi patrol boats, destroying eight drifting mines and successfully rescuing a downed USAF F-16 pilot from the waters off the Kuwaiti coast. Nicholas also escorted the battleships Missouri and Wisconsin during naval gunfire support operations near Khafji off the coast of the Saudi Arabian/Kuwaiti border. DD 449 shipmate John O’Neill (left) presents the 449’s data plate to Comdr. 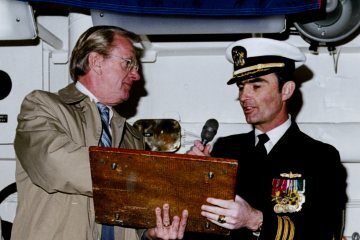 James Amerault, FFG 47’s first commanding officer at her commissioning, 10 March 1984. In her 1993 six-month deployment, Nicholas conducted operations in the Red, Mediterranean, Ionian and Adriatic Seas, supporting United Nations sanctions against the governments of Iraq and the Former Republic of Yugoslavia. During these operations, she safely conducted over 170 boardings of merchant vessels to inspect for illegal cargo shipments. In 1995, Nicholas deployed to the Adriatic and was assigned to the Standing NATO Forces Atlantic, again operating in support of United Nations resolutions in Operation SHARP GUARD. She intercepted over 120 vessels in enforcing sanctions against the Former Republic of Yugoslavia. She also ocated and rescued 16 Albanian citizens from a capsized fishing boat. The 2001 deployment took Nicholas to the Mediterranean Sea and Persian Gulf. While in the Mediterranean, she conducted numerous boardings in support of United Nations sanctions. On 11 September, Nicholas sortied on an emergency basis from Valletta, Malta and conducted sustained underway operations until returning to her home port of Norfolk, Virginia six months later. In 2003 Nicholas hosted COMNAVEURCENT, Ambassadors and many high ranking dignitaries in St. Petersburg, Russia. Later she became the first warship (and the first US warship ever) to enter Neum, Bosnia since 1917. While there, she hosted the Bosnian Tri-Presidency and numerous government and military officials. For the remainder of her six-month deployment, Nicholas operated as the sole US warship in the Mediterranean Sea and acted as a surrogate for the Argentinean ship Sarandi, enhancing international relations and building new alliances. She participated in multiple exercises and operations and achieved historic distinction when she tracked and assisted in the interception of a merchant ship loaded with nuclear centrifuges bound for Libya. US Government officials directly linked the interception of this vessel to the abandonment of Libya’s nuclear weapons program. Nicholas has earned the Combat Action Ribbon, Southwest Asia Service Medal (with three bronze stars), Armed Forces Expeditionary Medal, the NATO Medal, Kuwaiti Liberation Medal, Armed Forces Service Medal, Sea Service Ribbon (with seven bronze stars), Meritorious Unit Commendation, a Coast Guard Meritorious Unit Commendation (with O for Law Enforcement), and six Battle Efficiency Awards as top ship in her squadron. She remains in operation today from her home port at Norfolk, Virginia.